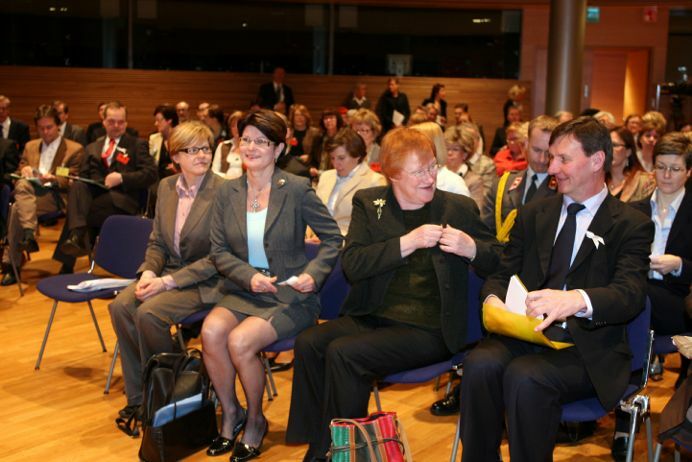 Council of Europe: Campaign against domestic violence: Tarja Halonen, President of the Republic of Finland, supports the campaign of the Council of Europe against Domestic Violence. At the invitation of Jukka Gustafsson, Contact Parliamentarian for Finland, Tarja Halonen, President of the Republic of Finland, will hold the opening address of the conference dedicated to the situation of Domestic Violence against Women in Finland (PDF) on 7 April in the Parliament of Finland. Paula Risikko, Minister of Health and Social Services, Sinikka Hurskainen, Chairperson of the Finnish delegation to the Parliamentary Assembly and Heidi Hautala, Chairperson of Legal Affairs Committee, will also contribute to the conference, together with Helena Ewalds and Manuel Lisboa, members of the Council of Europe Taskforce. On 2 April 2008, Jukka Gustafsson, Contact Parliamentarian for Finland also organised a media event to involve other members of the parliament against domestic violence. This event was inaugurated by the Speaker of the Finnish Parliament, Sauli Niinistö.